what u think about the Tri Turbo thing is it true ?? Either way,it looks stunning in those pictures!!! If the Turbo has a manual gear box. I am most likly in. I like them to get rid of the warts on the front bumper and make it center exhaust but those things are secondary. Drop the wieght to 3300 lbs on a manual and I'd be happy. I have a feeling the new TT will be strictly PDK. I'm really surprised they didn't lose the warts. Otherwise I like it. I'm most curious to see the price point. The word I got from my dealer is the Turbo (due in November) will have a base MSRP of 165K with the Turbo S at 185K. Turbo will probably be only PDK. i would go for the S if they come together .. but i really don't like to have the PCCB .. don't know if it's possible to change them after they wear up with normal steel ones .. is it possible ?? I had PCCB for 4 years on my road car GT3 and they were great. If you are planning to track the car, I could see where you would want non PCCB brakes. I understand that PCCB can be replaced but, like anything Porsche, it's a matter of lots of $$$$. 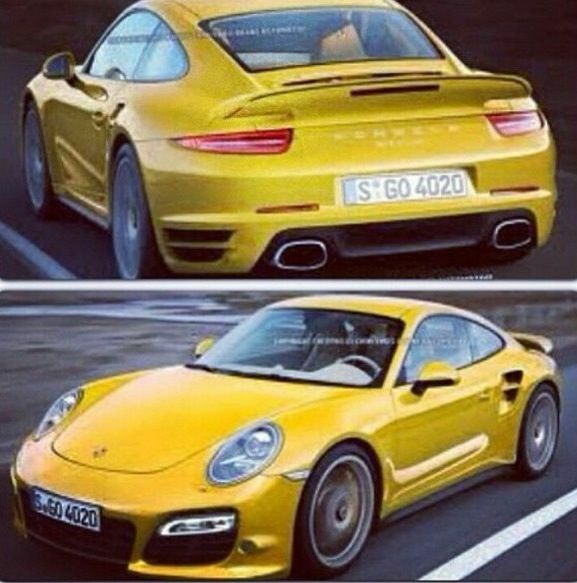 as fast as the 991S is you have to ask your self if the turbo is worth the upcharge. With what PAG has done with the GT3-PDK only-I wouldn't be shocked if all the GT cars and Turbo's were PDK. Now that the Ferrari V8's are the Turbo marketing targets and the GTR is the GT3 marketing target-look for a purely electronic Turbo with AWD, AWS, PDK, PTV, plus some Mercedes-based gimmicks like lane-change warnings, automatic braking when closing in on other vehicles, and alarms for warning you that you have driven on to the road shoulder if you get sleepy while driving it. Yeah but a 993 turbo is beautiful. That's not to say the 991 isn't. In fact it's been growing on me so much that I went for a test drive , hoping to love it, which may have led me to trade my 997.2TT in. While nice, the 991S is materially slower than my TT. So no way I could pull the trigger. I think I would always be disappointed to not get the thrill of being pushed back into the seat when jamming on the gas. All of that is to say I am waiting for the 991 TT. Someone here mentioned November. My dealer said it would be unveiled at Frankfurt, with deliveries in spring of 2014. Someone also implied the base and S coming out at same time. That would be awesome, but my guess is they stagger it. I've also heard about simultaneous unveiling of turbo and turbo S, the only reason I can think that it makes sense is if they offer turbo with manual and turbo S with more goodies and PDK trans. As far as the upcharge for a turbo, some people just prefer the feel of the turbo over a standard C2, others do it for the appeal. Different strokes for different folks. 1) Wider body then C4 or GT3 - using the RS body style. 2) Will have 4 wheel steering as an optoin. 4) Will PDK only - I was saddened but says that its what he is hearing. 5) PDK will similar to the one in the C2/C4 with 6 gears and overdrive. 6) Rev limit range will be smilar to C2/C4 engine. So far he was dead on with the GT3 so unless the info he is getting is wrong another disappointing day for us manual lovers. Oh and for those waiting on the Targa its going to be after the Turbo (January release or something like that). That all sounds correct, the only one that is up in the air is the PDK, but based on the new GT3 and the accuracy of the other points, I'm inclined to say that it is correct. It's so difficult for me to see the new turbo without a manual if it's true.